Troy Fraser was elected in 1996 to serve Senate District 24, a 21-county region that is located in the geographic center of Texas. District 24 comprises the following counties: Bell, Blanco, Brown, Burnet, Callahan, Coleman, Comanche, Eastland, Erath, Gillespie, Hamilton, Kerr, Kimble, Lampasas, Llano, Mason, McCulloch, Menard, Mills, San Saba and Taylor. Key cities in the district include Abilene, Brownwood, Belton, Fredericksburg, Killeen, Kerrville, Marble Falls, Stephenville and Temple. It also contains two major military installations, Fort Hood near Killeen, and Dyess Air Force Base in Abilene. Elected by his fellow Senators in June, Senator Fraser is currently serving as President Pro Tempore of the Texas Senate. 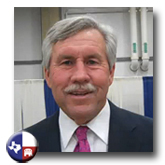 As President Pro-Tempore, Fraser is third in line for the Governor's seat and will be given the responsibility over the next 18 months to serve in that capacity in the event that Governor Rick Perry and Lieutenant Governor David Dewhurst are out of the state. Senator Fraser serves as chairman of the Senate Committee on Natural Resources. This committee handles the flow of legislation in a number of policy areas, including water resources, air quality, oil and gas, waste, agriculture, and parks and wildlife. Senator Fraser also sits on the following standing Senate committees: Business and Commerce, State Affairs, Nominations, and International Relations & Trade. Since his election in 1996, Senator Fraser has been consistently ranked by leading organizations as one of the most conservative members of the Texas Senate for his voting record on fiscal and social issues. For his pro-business, pro-Texas voting record during the 2007 legislative session, he was named a "Champion of Free Enterprise" by the Texas Association of Business. Senator Fraser has been recognized for his outstanding leadership and received numerous awards. In 2003, he was honored as the State Official of the Year by the National Association of Home Builders. He was also recognized in 2003 by Texans for Lawsuit Reform for his contributions to civil justice reform in Texas. In 2004, Senator Fraser was honored by the Association of the United States Army for his exceptional service in support of national defense. In 2006, Senator Fraser was named the top Legislator in the nation by the American Legislative Exchange Council, the association for state legislators, as a result of Fraser's landmark legislation passed in the areas of telecommunications, electricity deregulation, renewable energy, and property and casualty insurance. In 2008, Fraser received the "Wind Champion Legacy" award from The Wind Coalition for his vision in enacting state policy that allowed for the growth of the wind industry. Prior to his election to the Texas Senate in 1996, Senator Fraser served three terms in the Texas House of Representatives, from 1988 to 1992. As a member of the Texas House, Fraser was named the 1991 National Republican Legislator of the Year and honored by the Texas State Chamber for his work as co-sponsor of the 1989 workers' compensation reform legislation. He was also named a "Top Ten" conservative legislator by a coalition representing more than 300,000 conservative activists. Senator Fraser is a longtime business, civic and Republican Party leader. He has served as a chamber of commerce president and as Chairman of the Economic Development Council. He has also been a Little League coach, Rotary president, and was chosen Lions Club Man of the Year. Senator Fraser is the founder and former chief development officer of Pal-Ex, Inc., an international, publicly traded company. Pal-Ex's predecessor, Fraser Industries, began as a small backyard operation in West Texas, and expanded to become one of the nation's largest manufacturers and recyclers of wooden pallets. Born August 10, 1949, in Abilene, Fraser was raised in the small West Texas town of Coahoma. He attended Angelo State University and the University of Texas at Arlington. He has been married to his wife, the former Linda Cochran, for 40 years. They have three children and four grandchildren. "We've got a lot of work to do to make sure everyone gets to the polls. It should be a good Republican year this year! I'm excited that we're going to gain ground not only in Texas, but all over America."